I’m at my in-law’s. There is a dangerous amount of cake and candy in the house, enough to send the entire staff at Atkins into a diabetic coma; there are a number of tubs of something called puppy chow that involves peanut butter, cereal and chocolate. There are enough at least five different kinds of candy canes, even a clove flavored one. There are Zots and Mary Janes and peppermint patties. There are not, however, any brownies. There haven’t been any since I’ve been in the family and I think I may have finally stumbled upon the real reason why they seem to be contraband here. There have been rumors swirling around for years, and I had heard a vague and mysterious story by way of explanation a few times, something about voices and an overdose. But I think I may have finally gotten the real story on a dark family secret during my last visit. First a little background: There are several refrigerator magnets and a number of mugs and aprons in the house proclaiming a deep and passionate love of chocolate. There are also several (and I mean several) candy dishes that maintain a pretty high level of chocolate candy occupancy scattered around the house and not just at the holidays. The most popular cake in my mother-in-law’s extensive repertoire is Chocolate Mocha Butter cake. People were pressing their fingers onto the crumbs of the chocolate and raspberry wedding cake she made when I got married so as not to waste even a smidge of it. She bakes a mean chocolate cake, this woman. Nothing gets her heart racing like an all you can eat chocolate buffet with a chocolate fountain. So let’s just say euphemistically speaking that there may or may not be a chocolate “issue” here. I’ve heard bits of the story before, but during my last visit I asked about the brownies she made that made her hear voices in the night. She made a large pan of her favorite brownies. Frosted. There was the original “taste test” square that afternoon, just to make sure the recipe was still good. Then a couple more squares nudged out of the pan before supper, because the recipe was still good. 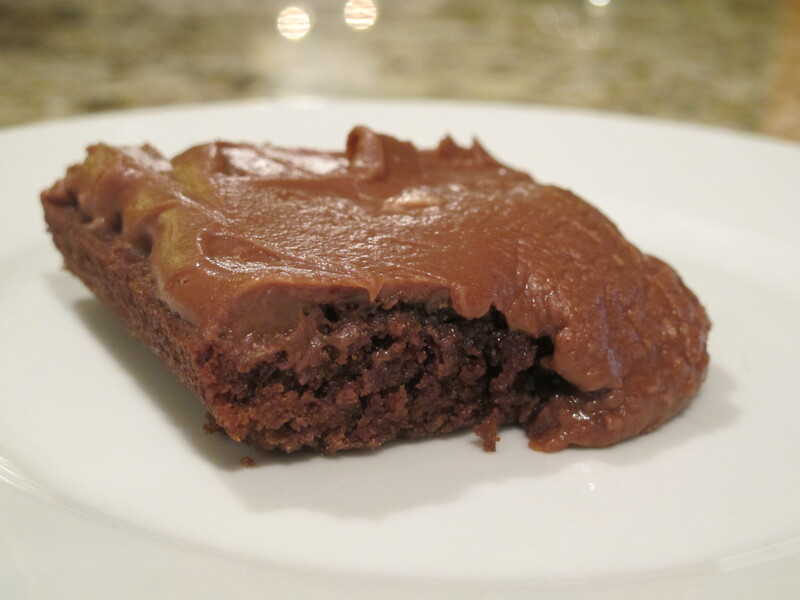 Then just a tiny piece more to even out that side of the pan, not a whole brownie…just a sliver. Then a couple more for dessert. Pre – bedtime snack. Midnight snack. By 1 AM about half the pan of brownies is gone, like a lasagna pan sized pan. And she can’t go to sleep. She’s tossing and turning for hours, buzzing, can’t turn her brain off, can’t go to sleep. Man, those brownies are good. It’s like they are calling her name from their pan all the way across the house in the pantry. About 4 AM, she hears my father in law stirring in bed next to her. This is her recipe as she wrote it down for me – what I like to call “still small voice brownies”. If you make it and hear voices, don’t say I didn’t warn you. Melt butter and add cocoa, stir well. Beat eggs and sugar. Add to butter – cocoa mixture and then add vanilla. add flour, baking powder and nuts. Mix well. Bake about 24 minutes at 350. I use Baker’s Joy to prepare the pan. frost when cooled. Mix all together over low heat. Don’t cook too long, just enough to heat thoroughly and blend. Definitely making this!! We’ll happily take on the obsession here until we hear otherwise from God. I just got back from Cambodia where lots of foods make you hear “still small voices.” Are you sure there isn’t a secret ingredient she left out? There is enough sugar and cocoa in this recipe to make anyone hear voices. My own recipe (which I will post soon) is a little less hallucinogenic.